"But My Carpets Don't Look Dirty! Why Should I Clean Them?" Contaminents Before You Can Even See It! Don't Wait. Call 682-9483 Now! "Do I Really Need To Clean My Carpet?" This is a commonly asked question. I have had people say that they have not had their carpets cleaned in 10 years or more because they have relied on myths and misconceptions about carpet cleaning. The fact is that cleaning extends the life of your carpet and saves you the tremendous amount of money required to replace prematurely worn carpet. Carpets cleaned on a regular basis provide a healthy, safe living environment for you and your family at the same time adding years of life to one of the larger investments in your home. So the real question is, how often should they be cleaned? The answer can depend on several factors and the chart below taken from the IICRC Reference Guide for, Professional Carpet Cleaning can assist you in answering this all important question. Did you know that according to the Institute of Inspection, Cleaning and Restoration (IICRC) you should have your carpets cleaned AT LEAST 1 TIME PER YEAR depending on the amount of traffic? To help you decide how often your carpets need to be cleaned, I have included a graph (above) from the IICRC S100 book, 2006 edition. These standards provide the guidelines used by the Carpet Industry to give your carpet the longest life possible. Always Clean For Health First, Then Appearance Second! Carpets and rugs are designed and manufactured in a way that hide soil and stains way down deep at the base of the carpet fibers. Harmful contaminants can remain hidden under a soiled carpeted surface for long time without being noticed. Food stains and spilled beverages start to decay over time with bacteria, fungus and odor developing shortly after. So make a definite commitment to yourself and your family to clean your carpets and rugs on a regular basis (at least once or twice a year). We offer customized annual cleaning plan's that are specifically designed to effectively help you maintain a cleaner safer living environment for you, your family and your pets. 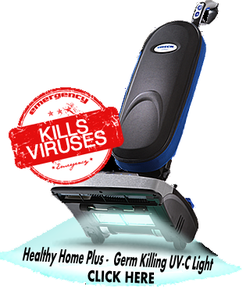 Click on the Vacuum Above to Learn More About UV-C Cleaning Technology!